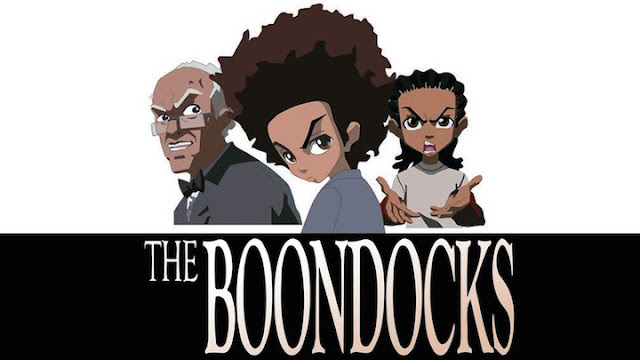 Around the fall of 2005, I saw an ad for a show titled, "The Boondocks," in one of the magazines I was reading. I mentioned it to a friend and he stated that it was probably going to be bad, for such and such reasons. At the time I held his opinion so high that I let him convince me to completely ignore it. I never thought about the show again until sometime in early 2016. A different friend kept telling me about certain scenarios on the show and each one made me laugh. One weekend he showed me an episode and I was totally on board. From there, I watched one to two episodes a day until all four seasons were complete. The Boondocks is an animated series that focuses on the Freeman family, a trio of characters made up of Huey, Riley, and Granddad. After Huey and Riley's parents died, Granddad decided to take their inheritance to move to the wealthy (and prominently "white") suburb of Woodcrest. Just that alone makes for fun writing -- a clash of cultures being the main storylines for several of the episodes. But before I get into more of the actual show itself, let me express my love for Asheru's music and lyrics (listed below) for "The Boondocks" theme song. Though the song was a remix of Asheru's tune "Judo Flip," the song still matches the show seamlessly. Not only does it complement the egotism of the show's characters, but it gives so much more dimension to the strength of their backstories. And while we're on the subject of the characters and their backstories, let's talk about one of the best features of the series: the way each character is introduced is almost the same way people in our lives are introduced. We get a first impression and we typically categorize them. Over time we get more insight into their personality. 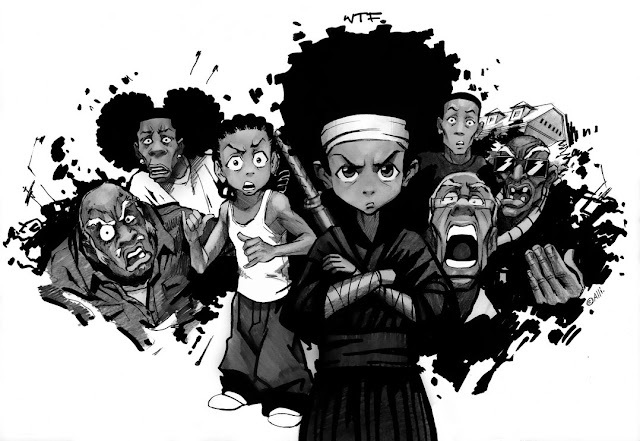 "The Boondocks" slowly explore their characters in the same manner. Creator Aaron McGruder based the show on his comic strip, and was able to get an excellent cast, starting with Regina King as both Huey and Riley. 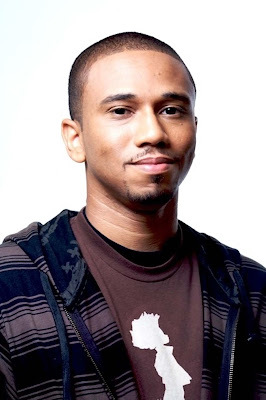 King has been acting since an early age, with an impressive list of shows such as "227" and "Southland." She thrives as a dramatic actress with good comedic timing. Seeing her name in the credits was a bit unexpected, but it makes sense after viewing all four seasons. Playing both characters utilizes both drama and comedy. Huey is a leftist radical black revolutionary, while Riley is more laid back with dreams of living a gangsta rapper lifestyle. Comedy great John Witherspoon (Friday and "The Wayans Bros.") plays Granddad. Don't be fooled though; Granddad is not your typical elderly character. He dates, he blows through money, and he has a rich history in political events. Often I think that Huey and Riley are his shoulder angels. Granddad seems to have a mixture of both of their traits and can be swayed to do good or bad, depending on which of his angels is more convincing (or convenient) at the time. Outside of the main trio is a collection of very odd characters. The show boasts a roster of great actors, including Cedric Yarbrough, Samuel L. Jackson, Ed Asner, Charlie Murphy, Mos Def, Xzibit, Fred Willard, Snoop Dog, Busta Rhymes, Cee-Lo Green, and Katt Williams. 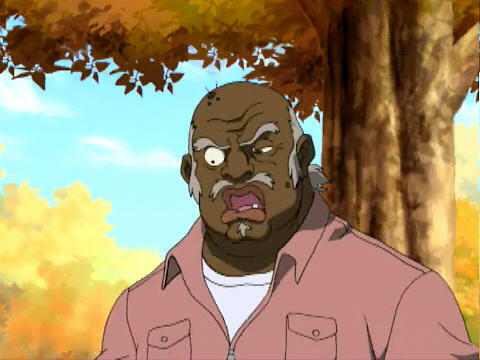 One of my favorites is Uncle Ruckus (voiced by Gary Anthony Williams), someone you love to hate. Every time he's onscreen his theme music comes on, and it's not a flattering theme at that. Sometimes we hear the music just before he gets onscreen which makes his impending appearance all that more enjoyable. I'm always surprised when he appears because he pops up in random places. Since he has about 32 jobs that he works throughout a week, you never know where he is at any given time. Ruckus is often found supporting white people, claiming that he himself is white and that he has "the opposite skin condition that Michael Jackson had" (vitiligo). Ruckus is truly a character. Though he gets the Freemans in trouble, you wouldn't want an episode without him. Another aspect that I get a kick out of are the multitude of references and homages. Sometimes it could be a historical event (recent or past), sometimes a scene is picked straight out of other movies or TV shows (like "Breaking Bad" for example), and sometimes it could be a character design. Side characters/bit parts are made to look exactly like someone from an old show, usually from an African-Amercian based show. There's even a character that looks exactly like Pearl (played by Helen Martin) from "227." In a season 3 episode titled "Stinkmeaner 3: The Hateocracy," Stinkmeaner is joined by three other characters, all of whom have very distinctive designs. Crabmiser looks like Fred Sanford (Redd Foxx's character on "Sanford and Son"). Gripenasty looks like Aunt Esther (from the same show), and Pissedofferson is an obvious take on J.J. from "Good Times." The show is more than just a series of goofy jokes though. There are also cultural messages. 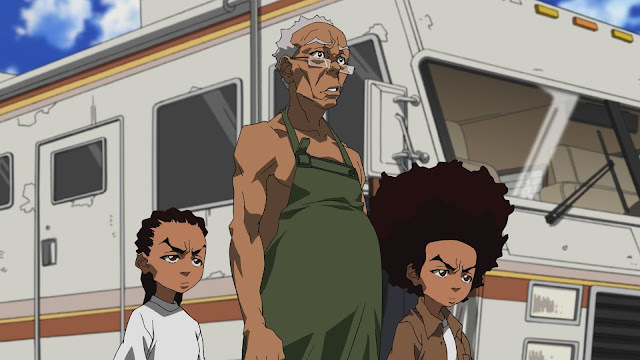 Though "Boondocks" has been given a lot of beef over its use of the "N" word and its representation of races, there's still a lot to gain from the humor. Much like Dave Chappelle's show back in 2003 ("Chappelle's Show"), poking fun at stereotypes and misinterpretations of cultures makes understanding more accessible. After all, it's easier to relate to a point of view through a funny story than an argument. The show has too much to cover in one article, but needless to say, I'm a fan. It's another lesson to make my own decisions on what or what not to watch. Try it out yourself and discover a show unlike most. 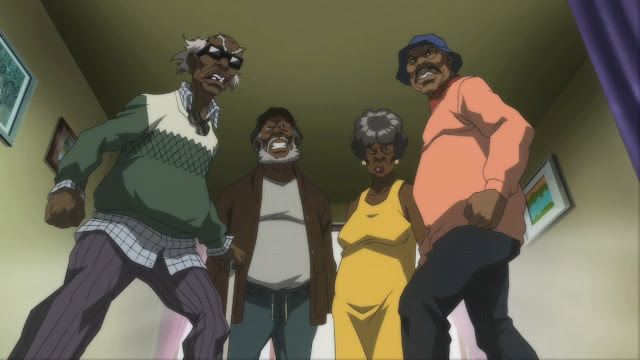 TRIVIA: The music that plays when Uncle Ruckus appears is a variation of John Williams's "Jabba's Theme" from Star Wars: Episode VI - Return of the Jedi (1983).